Sagebrush steppe is one of the most widely distributed ecosystems in North America. Found in eleven western states, this important yet fragile ecosystem is dominated by sagebrush, but also contains a diversity of native shrubs, grasses, and flowering plants. It provides critical habitat for wildlife like pronghorn and threatened species such as the greater sage-grouse, and is grazed by livestock on public and private lands. However, this landscape is increasingly threatened by shifts in wildfire patterns, the spread of invasive grasses, and changing climate conditions. 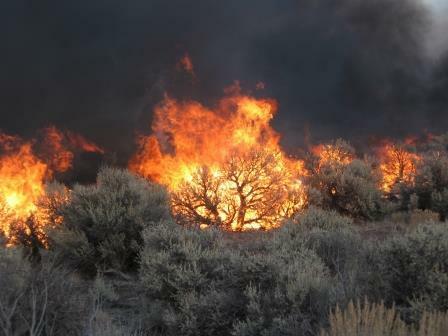 While sagebrush is slow to recover after fires, non-native grasses such as cheatgrass thrive in post-fire conditions and the spread of these species can increase the frequency and intensity of wildfires. These changes to the sagebrush ecosystems have implications for big game, threatened wildlife, and ranching. To address this growing concern, resource managers will often try to limit the spread of exotic grasses after fire events by applying herbicides, or will help native species recover through seeding or planting. However, these treatments have mixed results, and poor success is often attributed to droughts, which make it more difficult for seeds and native plants to survive; to the limited amount of time in which these treatments can be applied (usually in the first year after a fire); or because the seeds or plants used aren’t adapted to the environmental conditions of the location where they’re applied. The goal of this project is to improve our understanding of the factors that affect post-fire treatment success. Researchers will use data collected from more than 300 fires over the last 40 years, after which treatments were applied. They will identify the impacts of drought on those treatments, how incorporating information on drought forecasts or extending the period over which treatments are applied could have altered the outcomes, and how managers can better select plant material that will be more adaptable to the conditions of planting locations. Addressing this knowledge gap has been identified as a high priority in the DOI Integrated Rangeland Fire Management Strategy, by the BLM Emergency Stabilization and Rehabilitation Program, and by state management agencies in the West. The results of this project will support adaptive management of sagebrush ecosystems, which will be critical if these ecologically and economically important landscapes are to be maintained into the future. This project was jointly funded by the Southwest, North Central and Northwest CASCs.